The handy little Clipboard included in Windows is like an undercover agent that does the heavy lifting, yet no one knows it’s there. After all, copying and pasting files and data is one of the most used functions in the operating system. The Clipboard may not be visible, but we use it all the time, and it is hard to imagine it not being there at all. Any text, image, or information about a file or folder that you copy (or cut) is placed in your Clipboard, and then you can use that data stored in the clipboard to past it somewhere else — be it a directory or a document. The Windows implementation is severely restricted, however, in that it can only hold one copied element at a time, making it quite inefficient as a tool. Luckily, third-party clipboard managers are highly evolved and can hold a nearly unlimited number of copied elements at once. They even let you organize them, or search through your clips, making them almost a necessity for power users, or even people that deal with a lot of image or text content daily. With all that said, let’s meet some of the best clipboard managers around. If you need something with a fluent UI and quality organizational features, then your search will probably start and end with ClipClip. This clipboard manager sits at the top of this highly competitive mountain for a reason. And that being the fact that it strikes that perfect balance between features and usability. The program finds a place in your system tray and keeps an eye on everything you copy. Text, images, links, what have you. Everything is stored in the form of chronologically organized clips that can easily be accessed. It is also possible to arrange the clips into folders. But where ClipClip excels at, is in how it handles pasting of your clips. You can drag and drop them anywhere, or hit a keyboard shortcut and paste it from the small window that opens up. You can find the clips instantly with the search function, and Google Drive integration makes collaboration with others easy. A neatly rounded feature set, speedy performance, and constant usage make ClipClip an excellent option for those starting out with clipboard managers. The fact that it is available for free only sweetens the deal. The professional design combines with the neatly organized and a supercharged feature set to make ClipboardFusion one of the finest applications of its kind. Available in both free and paid varieties, this program is an excellent choice, particularly for programmers, and those that deal with text. You get the ability to quickly remove formatting from the text you copied, with three different ways of scrubbing the text. It is also possible to run useful macro commands on the content of your clipboard, written in C#. ClipboardFusion has Clip Preview, accessible from the system tray, where it snuggly sits. The syncing function available as a premium option makes it possible either store the clippings for use again or sharing with other computers and mobile devices. Any data sent and received is encrypted using secure 256-bit encryption. All these features make this an outstanding option for professionals. But even without buying a license, ClipboardFusion offers enough features in a neatly rounded design that it wins our hearty recommendation. Give it a try on your PC, and also take a look at the various mobile apps available if you decide to go with this one. With a name like this, no wonder this program is near the top of this list. One of the most powerful solutions you can get your hands on, Clipboard Master can store up to 10,000 entries, in order, and make it available for access instantly. Throw in any text, multimedia content, or even general files, and it will not only store your data but allow you to search it, thanks to the built-in search and filtering functions. You can even create screenshots right from within Clipboard Master, and the developers have even added in a handy little password manager in that works as intended. Which is to say, it encrypts your data and allows you to enter it without typing. A master password is also available as an extra layer of protection. All these features make Clipboard Master one of the best applications of its kind around, and certainly one of the more powerful regarding raw features and capabilities. There’s always at least one program that offers an excellent experience, even though it is no longer updated. ClipX is the one in this category. A tiny program that takes just 67 KB of disk space, and offers a slew of useful features, but one that has not been updated for quite some time now. But it still functions as intended on Windows 10, and the premise is the same as other clipboard managers on this list — you copy items usually, and then access them via a shortcut key. The clipboard queue displays the images, which makes it very easy to pick an item when in a program like say, Word. You just press the Winkey + V combination, and either click on the item in the window that pops up, or presses the number, and you paste the clip. Other than that, expect the standard array of features. The program stores 25 items by default, though you can increase it up to 1024. There is a search function, and you can edit text clips if you want. Plugins are in the mix too; you can download it from the program website. Ask anyone to name a clipboard manager, and they will probably name Ditto. It is one of the oldest such programs around, and possibly the most famous. However, while this 64-bit program contains impressive features, it’s also a bit overloaded, and as you will find out, that’s not always a good thing. Just like most other application in this list, Ditto resides in the system tray, saving all your clips in chronological order. The user interface is easy enough to use, and a hotkey is all you need to paste from your keyboard. A built-in search feature is also available, which makes it easy to find whatever you want. That said, the user interface of this free program leaves a bit to be desired and is something that will take a fair bit of time getting used. The settings panel, in particular, is filled to the brim with options, which may be intimidating for novices. And although it does not have too many advanced or modern features, you do get used of a database that allows you to keep clipboards from multiple computers synced. Ditto also encrypts your data when sending it over the network, which is important. If you are looking for a fast and lightweight clipboard manager, albeit one that is due to a UI refresh, then Ditto may just be what you need. Just be sure to learn the ropes first to make the most of it. 1Clipboard is an app that prioritizes looks over functionality, though there is loads of both here. 1Clipboard probably is one of the best-looking clipboard managers, but this smart approach comes at the expense of functionality, as pasting the clips requires more effort. Which makes it ideal for casual users, but not for people that rely on their clipboard managers for hundreds of tasks through the day. Nevertheless, the program behaves like other similar applications, living in the system tray and saving all the material that you copy. Pasting the items is a manual ordeal — you can’t just drag and drop them, or click to paste. The program is also limited in its organizational approach. While you can mark your favorite clippings by applying star, 1Clipboad currently does not have the ability to create folders to organize the clipped items. With some usability improvements, this one can climb the ranks. But as things stand, 1Clipboad is a fair experience, most suited for users that occasionally need to clip multiple items. With its traditional look and luxurious appearance, the freeware Save.me is an efficient clipboard manager available for your Windows 10 PC. Features start with it being able to save anything you throw at it to your clipboard — text, graphics, files, folders, even URLs, and emails — and end with easy organization of your entries. Save.me is a fully portable tool that you can run from anywhere, without the need to install. But its most disappointing aspect remains the lack of a Quick Paste function, which makes its usage rather cumbersome. Plus, the fact that no shortcut support is on offer only drags the program down further. Still its easy accessibility, a familiar user interface, and included search capabilities, make Save.me worth a try. If you like your software advanced, with appropriately high learning curves, then Clipjump may just be the one for you. It offers a relatively sophisticated set of features that you will be required to spend some time with to master. But once you do, you will find that behind the bland user interface is a trove of highly developed features. It is because you can set different channels, and give each channel its history — comes in real handy for times when you want to organize your data, or have a lot of information that you are dealing. Clipjump supports text, images, and files, and pasting the data is as simple as pressing the Ctrl + V key combination and then navigating through the clipboard history. In this program, there is a search function, and it displays a range of information in a single panel where all the action happens. Speaking of which the Action Mode is what you will be using to access the settings and other advanced features that Clipjump offers. Certainly not the one for beginners, but power users will want to give this program a look. Let’s move onto ShapeShifter, which is less a clipboard manager, more a clipboard extender. This program does not mess around with elaborate and extravagant features, no sir. Instead, it excels at one task, and one task alone — and that is enhancing the functionality of the built-in Windows Clipboard. And like the default option, this program supports a broad range of data, from text to HTML, pictures, and videos to regular files, even. It is something that very few clipboard managers offer. This simplified usage means that you don’t even need to learn fancy new keyboard shortcuts to manage what you clip with ShapeShifter. The Ctrl + C and Ctrl + V combinations work well enough. Pressing and holding Ctrl + V will show you your Clipboard history, where you can select any data and paste it in. It does entail some getting used to, however, the key combinations, since this is what Windows also uses to move things around. ShapeShifter is not without its limitations, though. Innovative as it is, the program does not have a search function right now, which is a major drawback for users with heavy workloads. Then again, considering the regular updates it sees, we may yet see search capabilities added in future versions. The odd one is out. Copy Space is a Window Store app, which makes this clipboard manager very unlike than the others on the list, which means that the app works very differently than others. For starters, it’s not very fast and severally lacks in functionality. Instead of a small window that sits in the system tray, this one makes use of a large panel that once launched works in the background saving all your clips. That said, some bugs prevent Copy Space from saving a clip now and then. Reliability is one of its bigger issues. Copy Space is, of course, a free app, with optional in-app purchases. A paid version of Copy Space is available, which lets you access to features like syncing through Google Drive. 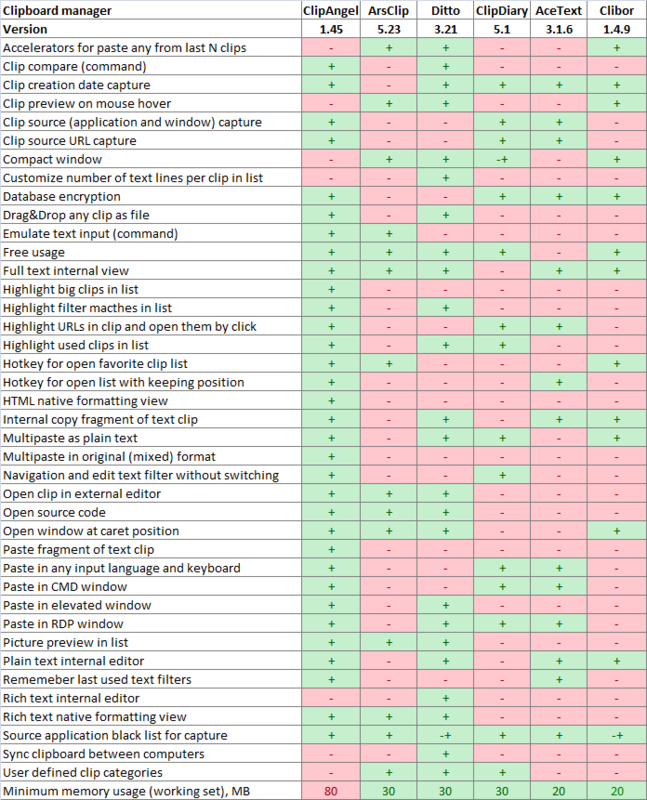 Still, it probably will be the only option for users of Windows 10 S, and though it may not be very intuitive, and have a lot to improve upon, Copy Space has earned its position on this list. It just has a long way to go to compete with the top picks.